Recently WWF-UK hosted a conference to discuss the future of spatial intelligence in the conservation sector. 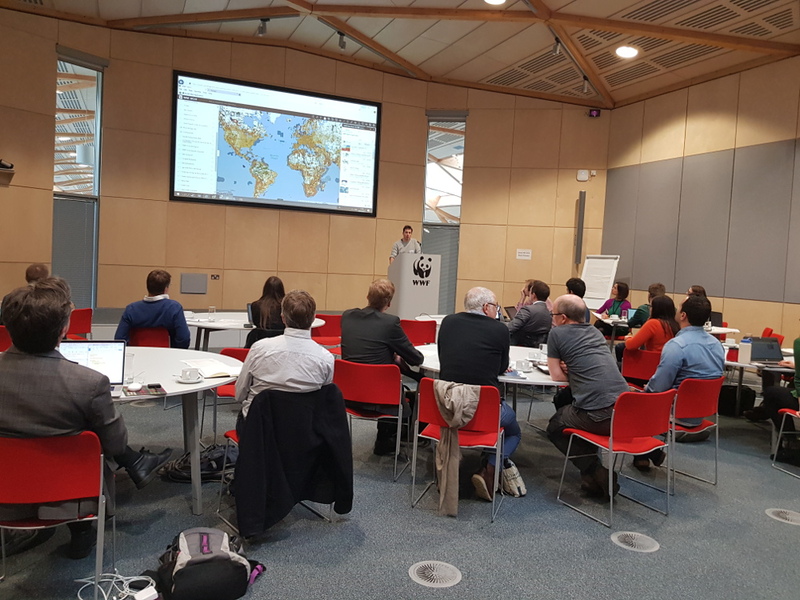 The two-day meeting explored how the diversity of spatial datasets available could best achieve conservation outcomes, and brought together key actors from the conservation, business intelligence and financial sectors. Representatives from a number of conservation intelligence ‘tools’, such as the Integrated Biodiversity Assessment Tool, (IBAT), Global Forest Watch , and Digital Observatory for Protected Areas (DOPA), were at the conference, just a small segment from the proliferating datasets available in recent years. Businesses and financial actors including DrillingInfo, S&P SNL, J P Morgan, and Investec Asset Management demonstrated interest in how the results of datasets could best be consolidated. “A fantastic range of spatial decision making tools and data were presented at the meeting,” said Susanne Schmitt, Extractives & Finance Manager at WWF-UK. “Frank discussions were had on how greater co-ordination, effective data sharing and analytics targeted for specific audiences could be leveraged and made accessible in a much more powerful way. This would result in greater conservation impact”. In the 21st century, remote sensing and biodiversity and environmental spatial data are proving themselves key to providing intelligence for the delivery of conservation, such as monitoring the sustainable development goals (SDGs). Some of the discussions that took place included how improved conservation reach and impact could be achieved through the collaboration of the major actors in the conservation sector. By sharing data to inform all, the monitoring, awareness and engagement capacity of the sector could be significantly improved, and there could be better spatial data equality across the conservation sector. The conference opened up discussions on to what extent this might be possible and steps for going forward.